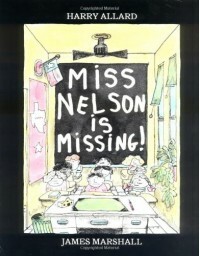 Miss Nelson is Missing is a childhood favorite of mine! It tells the story of a meek and lovely teacher named Miss Nelson who has an unruly class who takes advantage of her kindness and misbehaves constantly. To teach the class a lesson she decides to "go missing" and a new teacher steps in for her named Miss Viola Swamp. Miss Swamp is the exact opposite of Miss Nelson and doesn't take the class' awful behavior. In the end the class straightens out and begs for their old teacher back. When Miss Nelson does come back, the appreciate her and behave for her like angels. This book is a great tool to teach students about respect. If they don't respect their teacher and behave like the should in school, they could end up with a teacher like or even a visit from Miss Swamp!